CampusGroups allows you to either a) create a custom template with your group logo, colors, etc. that you can use and re-use when creating newsletters or b) to select a default template while composing an email. Mouse over the "Emails" tab (in the manage toolbar) and then click on "Compose email". 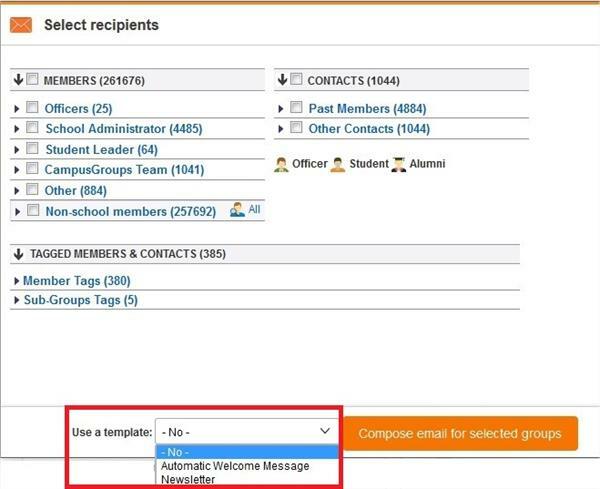 Select the members to whom you want to send an email, and select a custom template at the bottom of the page. 5. You can also pick a template by selecting a style thumbprint in the "Compose your email" section. 6. You can now change the title, the text and the pictures without modifying the template structure. 7. "Preview it first..." and then "Save and Send" it.